Your wedding is your most special and treasured day, shared with your most special and treasured people. 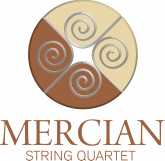 The Mercian String Quartet has been playing for weddings since 2009. We take pride in crafting a day of musical memories for you, one that will be evoked through smells, sights and sounds. At every stage, from the moment we say our first hello, until we wave you off at your venue, we take every step possible to make sure we give you a performance that speaks of you as a couple. As part of our tailoring to you, we have a quartet, a trio and a duo, each with its own extensive and far-reaching repertoire. And as a special gift, we offer you two pieces to add to our repertoire, so you know you will get the music you want. Get in touch to find out more and for a quote. "There were so many comments from people at the wedding that thought your performance added a special edge to the wedding that they were not expecting and made it really special."